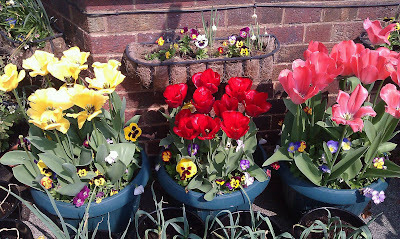 It’s still gloriously warm here and my tulips are nearly over. It’s more like mid summer than spring and we could really do with some rain to fill up the water butts. >Not summer here yet. There are daffodils out, but they have been snowed on. We're still having fires in the stove every night (and sometimes even during the day). Sigh. Be glad to send you some rain…it's very wet here.